Who knew that a dish packed with green beans would become such a traditional Thanksgiving Day recipe? Admittedly, I’m not a big fan of green beans. 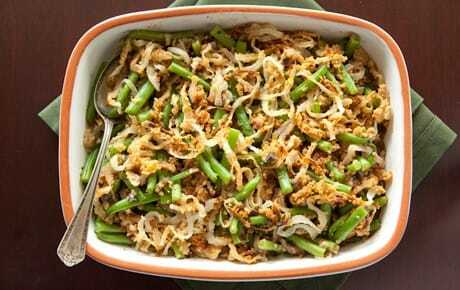 But there is something about a good Thanksgiving Green Bean Casserole that makes my mouth water! So now, Green Bean Casserole is a staple in my family – it’s on our table ever year, just like most families I know. And if Green Bean Casserole is on your Thanksgiving table every year, chances are, like most people, you probably just use that recipe on the back of the can of French’s fried onions. It’s a simple recipe, but man it’s good! Though, those fried onions can really rack up the Points in this dish. That’s why I made my own healthier version without the fried onions, and made my own pan fried ones instead! HUGE calorie and fat grams difference. With a few other changes to this traditional recipe, the end result gives you a generous 1 cup serving for just 3 Points. With this skinnier, healthier Green Bean Casserole Recipe, there’s no need to leave this delicious dish off your Thanksgiving table this year! And with just 3 Points per serving, you may find yourself preparing it more than just for Thanksgiving. Preheat oven to 400°F. Coat a 2 1/2-quart casserole dish with non-fat, butter flavored cooking spray. In a food processor, combine Fiber One cereal, salt and garlic powder until cereal has reached a very fine breadcrumb-like consistency. Place into large, Ziploc bag. In a small bowl toss onion slices with egg substitute to coat onions. Then place onion slices into Ziploc bag with the cereal mixture and shake well to coat. Spray a large nonstick skillet with the butter flavored cooking spray and set over medium-high heat. Add the onion slices and cook, turning once or twice, until golden and crispy, 4 to 5 minutes. Remove from heat, let cool and divide into two equally sized portions. Combine one portion of the onions, the green beans and mushrooms in the casserole dish. In a small bowl, mix buttermilk, soy sauce and yogurt and pepper, then pour over green beans, onions and mushrooms. Spread the remaining onion topping over the casserole. Bake the casserole until bubbling, about 15-20 minutes. Let cool for 5 minutes before serving. I’m sorry, but this recipe was just horrible. I took one bite and couldn’t even swallow it. I had to scrap the rest into the trash because I couldn’t even have it on my plate. And yes, I am a cook, a great one. I followed this recipe to the T and it was awful. why was it soo horrible?? what was the taste like? Would canned green beans work? My kids don’t like the frozen kind. Joni, yes, but it may be a bit soggier…you’d have to play around with the recipe and do some trial and error. Maybe use less milk.